Once you announce your pregnancy, page everyone tells you that your life will change. Some people tell you how awesome it’s going to be and how much fun you’ll have raising your babies. Others lament the end of sleeping in and late-night partying. But no one warns you about pregnancy. Sure they say your back will hurt and your feet will swell and all that fun stuff. But what people don’t tell you is that eating will become a part-time job. Now, I love to eat. I used to think “Man, it will be so nice to be able to eat all day!” And that’s still true. I still love to eat. But now I have to eat every 2 hours or so. Not a problem on the weekend when I’m never too far from my stocked pantry, but kind of distracting when I’m at work. I feel like I’m constantly snacking on trail mix, apples, clementines, string cheese, crackers… My coworkers may not remember what I sound like without my mouth full. Packing lunch in the morning has gone from a 5 minute thing to a long thought-out process and my filing cabinet looks more like a pantry than a file repository. So, what does all that have to do with this pasta? Nothing. I’m just so busy eating that I don’t have time to cook! Thankfully, this dish was super easy and super yummy. I have to say that I wasn’t too sure how this recipe would turn out when I started. It was one of those dishes where you poke around your fridge, pulling things out at random, then figure out how they should go together. 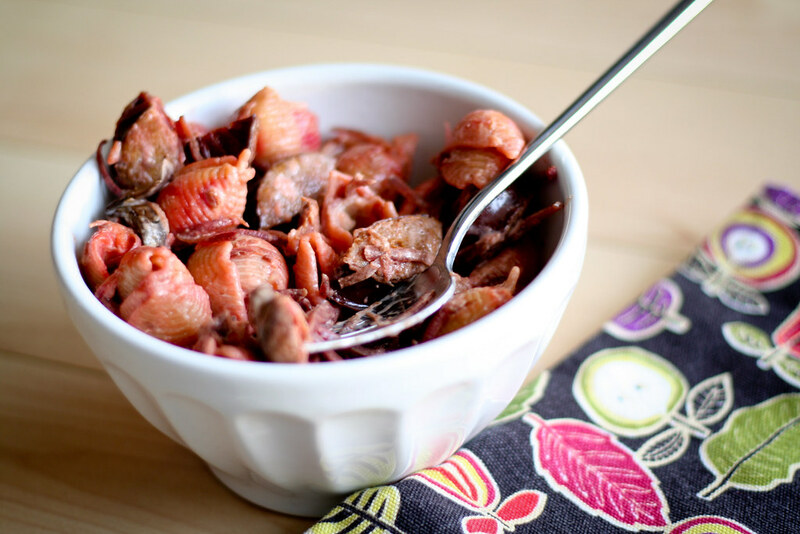 What to do with turkey kielbasa, beets and mushrooms? Make pasta, of course. I swear this recipe only took my 20 minutes start to finish and was surprisingly good. Nothing fancy, but simple comfort food perfect for the middle of a long and busy week. The shallots and beets sweeten and caramelize, and the mushrooms and kielbasa add great texture. Finished off with some cream, I just about devoured the whole thing before I could serve it. Set large skillet over medium heat. Once it’s hot, heat the oil then add the kielbasa and shallots and cook until the kielbasa is browned, about 6 – 8 minutes. Add the beets and chicken stock and simmer for an additional 5 minutes, then add the mushrooms. Continue cooking until the mushrooms and beets are tender, another 3 – 5 minutes or so. In the meantime, bring a pot of salted water to boil and cook your pasta until al dente. Drain and return to the pot. Empty the contents of the skillet into the pot, pour the cream over the top and toss until well combined. Taste and add salt if needed, but the chicken stock and pasta water should have added enough. Serve immediately and sprinkle with Parmesan cheese if you’d like. Oh, kielbasa! You have to come to Poland to try real Polish kielbasa ;) I love this post :) And congratulations!! This sounds soo good and so easy to make…great to have you back with your ‘expecting’ appetite. I really enjoyed eating when I was pregnant! Look forward to the next recipe.